German numismatist and archeologist; born Dec. 21, 1861, at Posen. After passing through the Friedrich-Wilhelms Gymnasium of his native city, he went in 1880 to the University of Berlin (Ph.D. 1884), where he studied classical philology. On the advice of Theodor Mommsen, of whose favorite pupils he was one, he took up as his specialty epigraphy and numismatics. 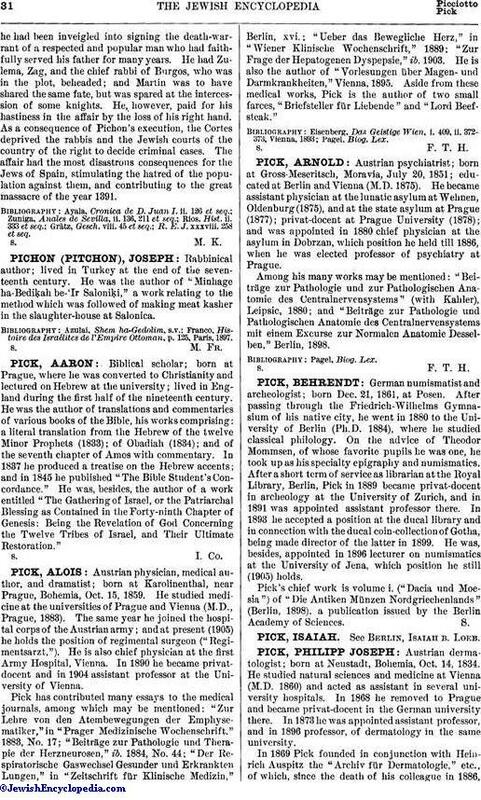 After a short term of service as librarian at the Royal Library, Berlin, Pick in 1889 became privat-docent in archeology at the University of Zurich, and in 1891 was appointed assistant professor there. In 1893 he accepted a position at the ducal library and in connection with the ducal coin-collection of Gotha, being made director of the latter in 1899. He was, besides, appointed in 1896 lecturer on numismatics at the University of Jena, which position he still (1905) holds. Pick's chief work is volume i. ("Dacia und Moesia") of "Die Antiken Münzen Nordgriechenlands" (Berlin, 1898), a publication issued by the Berlin Academy of Sciences.